From rolling vineyards to tasting rooms, to picnics amongst the vines, a vineyard vacation offers a relaxing, and perhaps romantic retreat. 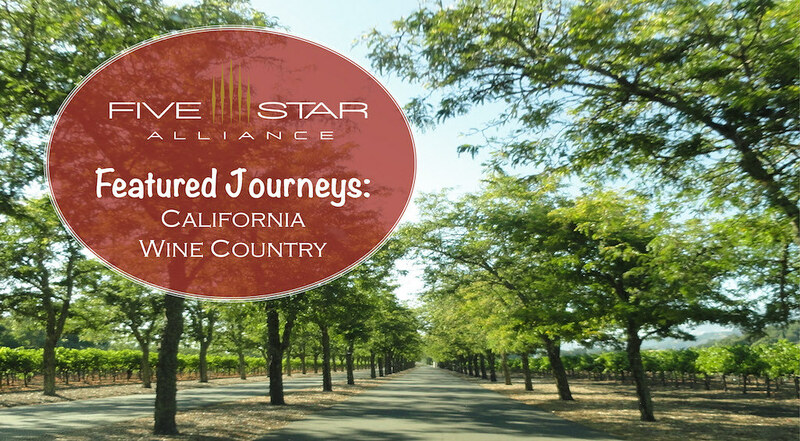 In this edition of Featured Journeys we're heading to Northern California's Wine Country with a multi-stop itinerary to Sonoma, Napa, and Monterey. There's a variety of airport options for this trip. Travelers could choose to fly roundtrip to San Francisco International, or another option would be to fly into Charles M. Schulz - Sonoma County Aiport (STS) and fly out of the Monterey Regional Airport (MRY). Regardless the itinerary, the drive between each stop is sure to provide panoramic scenery. Situated about 45 minutes north of San Francisco, Sonoma County offers a genuine wine country experience, with 76% of tourism businesses being small businesses, and 91% percent of the tourism businesses are locally-owned. This area is all about local cuisine, local growers, and of course, local wines. The area has a thriving art and food scene, and there's an array of outdoor opportunities like exploring the redwoods, hot air balooning, and vineyard hikes. Love the Peanuts Gang? A visit to this region wouldn't be complete without a trip to the Charles M. Schulz Museum with a collection dedicated to providing an in-depth look into the life and legacy of Peanuts comic strip creator, Charles M. Schulz. Situated in the Russian River Valley about 1.5 hours north of San Francisco, the Farmhouse Inn is family-owned, by owners with Sonoma roots dating back five generations. Surrounded by the towns of Healdsburg and Santa Rosa, the boutique property's restaurant is the recipient of a Michelin Star, there are Sommelier-led wine tours, and rooms have feather beds and curated wine refrigerators. FIVE STAR ALLIANCE PERK: Guests booking the "5 Star Signature Package" rate or "Best Available Rate" will also include full breakfast for two daily - a maximum daily credit of $50 per room, a $100 spa services credit per room/per stay, an in-room welcome amenity, and complimentary WiFi. From tasting rooms to stylisth boutiques, Napa Valley is haven for wine lovers and foodies alike. There are 6 Napa Valley restaurants that have received the prestigious Michelin Star, there's an array of cooking schools and five star accommodations in the heart of the vineyards, and the area is a hot spot for bakeries, chocolatiers, coffee, and gelato shops for those that want a little something sweet to pair with the wine. Music enthusiasts will want to note the area's music events which include Yountville Live (March), BottleRock Napa Valley (May), and the Robert Mondavi Concert Series which begins in July. Across from Beringer Vineyards, Las Alcobas Napa Valley is a luxury boutique hotel nestled in St. Helena. Set within a stately Victorian-style farmhouse built in 1907, the property offers accommodations designed by Yabu Pushelberg, with custom-crafted furniture and minimalist design. The signature restaurant, Acacia House serves award-winning California cuisine led by Top Chef Master Chris Cosentino. While the atrio spa offers a rejuvanating spa experience within a former farmhouse, and the outdoor pool provides one-of-a-kind vineyard views. FIVE STAR ALLIANCE PERK: Guests booking with Five Star Alliance receive daily full breakfast for each guest at Acacia House, a $100 spa credit per room/per stay, and a seasonal welcome amenity. Located about 150 miles south of Napa, Monterey County is home to more than 175 unique vineyards. The Monterey Wine Country experiences a "thermal rainbow" making the area ideal for growing grapes for Pinot Noir and Chardonnay, but it's diverse climate of ever-warming micro-climates helps the region support 42 wine varietals. From a daily Sommelier-led wine and cheese reception, to the Alila Experience Program offering a range of activities such as photography hikes and charcoal drawing classes, Ventana Big Sur is an adults-only retreat designed to provide guests with opportunities for self discovery, wellness, and finding one's place in the world. There are daily morning yoga classes and guided hikes, as well as two outdoor pools (one is clothing-optional), chef created cuisine, and a social house. The property makes an ideal base for rest and rejuvenation or exploring the vineyards of the Monterey area. FIVE STAR ALLIANCE PERK: Guests booking the "5 Star Signature Package" rate will also receive continental breakfast for two daily (maximum $30 credit per person/per day), a $100 resort credit per room/per stay, a welcome amenity, and an automatic room category upgrade at booking based on availability. Offering an on-site vineyard and a private label wine, Calistoga Ranch is a luxury nature resort with an award-winning Napa Spa and fitness programs. Featuring sustainable practices throughout the resort, guests can explore acres of scenic hiking trails, participate in painting and photography classes, play bocce ball, do yoga, or take a beekeeping course. In addition to a variety of on-site amenities, Five Star Alliance guests receive special perks at the resort. 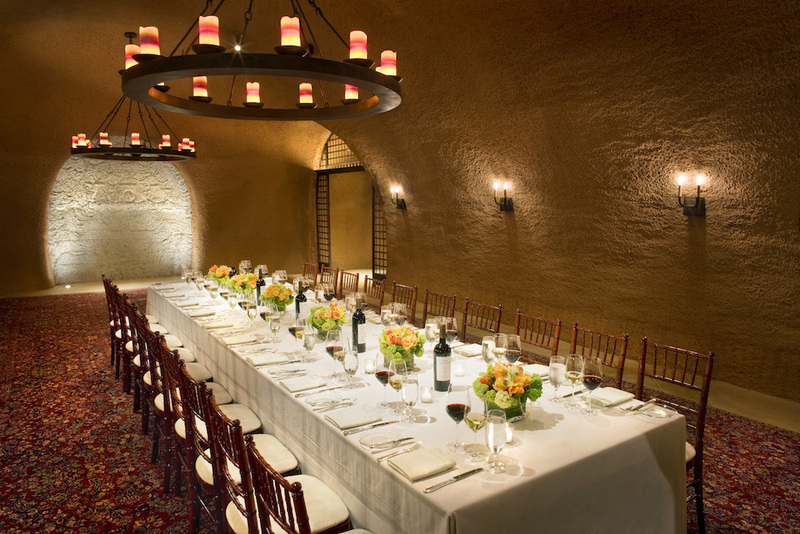 Learn more below the photo of a wine cave dinner. The nature resort's accommodations are set within 50 free-standing guest lodges, including Deluxe Lodges, One- and Two-Bedroom Lodges, as well as the Estate Lodge. Providing a refined environment for rustic relaxation, the lodges have floor-to-ceiling windows looking out to natural surroundings, wood floors, and furnishings with clean lines inspired by nature. Plus there are outdoor showers and bath gardens, cedar sun decks with gas fireplaces, and some lodges have private outdoor hot tubs. Continue reading below the photo the outdoor shower photo. Five Star Alliance Perk: All guests booking through Five Star Alliance receive complimentary access for two people to the Auberge Spa facility with a watsu soaking pool, steam room, and Jacuzzi. 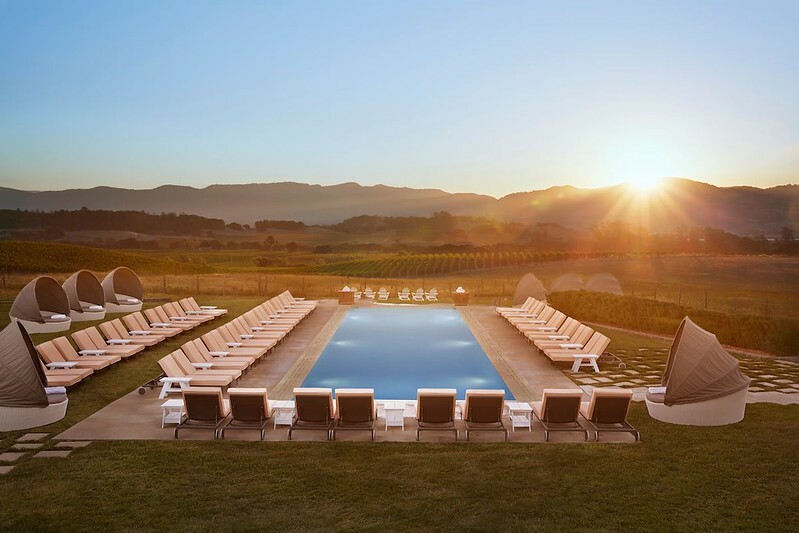 Nestled in the heart of Napa Valley Wine Country, The Carneros Inn is a luxury resort with three full-service restaurants - FARM, The Boon Fly Cafe, and the Hilltop Dining Room. The hotel's exclusive Spa at The Carneros Inn is available only to hotel guests, with treatments divided into three categories: the farms, the vineyards, and the gardens. There is an adults-only Hilltop Pool and hot tub, along with the family-friendly Otto's Pool with countryside views, plus a 3,000-square-foot fitness center, bocce ball courts, and complimentary bicycles. For guests seeking extra privacy, the Harvest Cottages include Fireside Butler Service for lighting outdoor firepits and filling hot tubs. Plus, the hotel offers two on-site shopping options: PlumpJackSport is a chic boutique with designer brands, and Market - an upscale general store, with Wine Country gifts. Continue reading for a Five Star Alliance Perk. Five Star Alliance Perk Alert: All guests making reservations with Five Star Alliance will receive daily breakfast for two at the Boon Fly Cafe, $100 spa credit, and VIP status. Subject to availability, room upgrades, early check-in, and late check-outs available. -Buildings that are designed with overhangs to reduce the heat gain from the summer sun, yet allow the winter sun's rays to enter and warm the rooms. Each room has 200 square feet of glass to allow for natural lighting. -When cooling is required, the first stage of intervention is for motor controlled exterior venetian blinds to lower to reduce the heat gain from the sun. When additional heating or cooling in guest rooms is necessary, water is used from 72, 300 foot wells on the property. -The large amount of glass used in each building reduces the daytime requirement for electrical lighting. LED, halogen, or fluorescent bulbs are used in light fixtures throughout the property. -All glues, adhesives, finishes, paints, carpets, and fabrics used at Bardessono are required to meet low volatile organic compounds (VOC) standards to vastly improve indoor air quality. -The combination of low VOC compound materials, no carpeting and drapes, all organic linens, terry and cleaning supplies, greatly reduces any potential allergens in the rooms. -Indoors, bathroom fixtures with low water flow have been installed, along with dual flush toilets and waterless urinals. Outdoors, native and drought tolerant plants have been chosen for landscaping in order to minimize water demand. 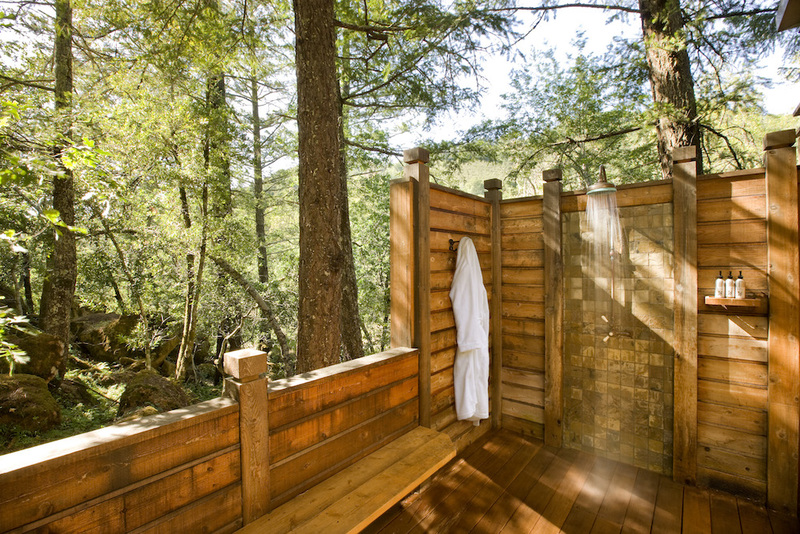 62 luxurious guest rooms in downtown Yountville, each designed for private in-room spa services. fiber bicycles, on-site producing gardens, and the inspired taste of artisan-crafted coffee. Bardessono is all this as well as a significant national model of green building and operating practices. spa treatments should be enjoyed in the special seclusion of each room. Tucked into a private canyon in the Upper Napa Valley on a 157-acre site marked by ancient oaks, majestic hills, a rock-hewn stream and private lake lies Calistoga Ranch. The 50 room luxury Napa resort captures the rich culture of food, wine and nature inherent to the region. Designed with relaxation in mind, lodges offer guests and owners the ultimate experience with a collection of indoor and outdoor spaces that allow you to fully experience the pristine setting. The 23-acre Tuscan inspired Villagio Inn and Spa features flowing water fountain pathways weaved throughout lush Mediterranean-style gardens. The centerpiece of the Yountville property is the 13,000-square-foot Spa Villagio, featuring sixteen treatment rooms and five intimate, private spa suites appointed with indoor and outdoor oversized sunken infinity tubs, fireplaces, steam showers, wet bars and flat screen televisions with Bose sound systems. One of the many signature treatments and spa packages that can be enjoyed by guests is the Spa Villagio After Dark experience. Start the day in your luxurious hotel guestroom. At dinner, experience the culinary epicenter of Napa Valley in a town that boasts the most Michelin Star rated restaurants on Washington Street. Your sensory journey continues after dinner where an inviting Spa Suite awaits you. Enjoy a glass of wine and a delicious dessert next to a crackling fireplace on your own private patio. Listen to your favorite music and take a soothing Mediterranean steam. Candles are lit and it's time to complete your ultimate evening of tranquility with a Mineral Soak in your infinity edge tub. Luxurious One Night Accommodations for Two at either Villagio Inn & Spa or Vintage Inn. Use of a Private Spa Suite for 1.5 hours. Sumptuous Champagne Breakfast & Afternoon Tea Service Each Day. Complimentary Daily Access to Spa Villagio Facilities and Amenities. Meritage Resort at Napa opened along with the Vino Bello Resort in 2006, creating the ultimate Wine Country destination. Situated across nine acres of vineyards, The Meritage Resort feature 504 luxury guest rooms and suites, a gourmet restaurant with an award-winning chef, two swimming pools, and premier meeting and event space.